"Salt Shaker" redirects here. For song by the Ying Yang Twins, see Salt Shaker (song). Salt and pepper shakers (or in the UK, salt and pepper pots) are condiment dispensers used in Western culture that are designed to allow diners to distribute grains of edible salt and ground peppercorns. Salt and pepper shakers are sometimes held in a cruet-stand. Salt and pepper shakers can be made from a variety of materials, including plastic, glass, metal, and ceramic. 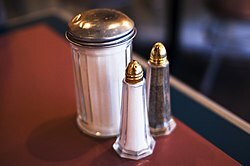 Salt shakers became increasingly common after anti-caking agents were introduced by the Morton Salt company in the 1920s. The Great Depression of the 1930s boosted the popularity of salt and pepper shakers as global ceramics producers concentrated on inexpensive items. Except in the most casual dining establishments, they are usually provided as a matched set, sometimes distinguishable only by the number of holes on the top of the shaker. Designs range from small, plain glass screw cap containers (invented by John Landis Mason, inventor of the Mason jar) to more ornate works of art. Sometimes the design refers to some pair of related objects—such as a replica of a West Highland White Terrier containing salt and a Scottish Terrier containing pepper. Designs may also relate to specific occasions or holidays. As a result of this diversity of design, collecting salt and pepper shakers is a hobby. Design of salt and pepper shakers has also been used to transmit cultural perspectives about race and other cultural values. There are two Museums of Salt and Pepper Shakers dedicated to showing the variety and history of salt and pepper shakers through the ages. The number of holes varies by culture, health and taste. In the United States where excessive salt is considered unhealthy, salt is stored in the shaker with the fewer holes, but in parts of Europe where pepper was historically a rare spice, this is reversed. In the UK, salt was often poured onto the side of one's plate and used for dipping, rather than shaken across the whole dish, hence salt cellars having a single, larger, hole. As an alternative to salt and pepper shakers, pepper may be distributed at the table by use of a pepper grinder, while salt may be distributed from a salt cellar or a salt mill. ^ Longenecker, E. Z. (1970) "Using the Slush Casting Method to Make Salt and Pepper Shakers." School Shop. 29(6) p. 56. ^ a b Derek Workman (23 January 2012). "Would You Like Some Salt and Pepper? How About 80,000 Shakers' Worth?". Smithsonian magazine. Smithsonian Institution. Retrieved 31 March 2013. ^ Holt, T. (1995) "Marking: Race, Race-making, and the Writing of History," American Historical Review. 100(1) p. 8. ^ Dubin, S. (1987) "Symbolic Slavery: Black Representations in Popular Culture," Social Problems. 34(2) p 126. ^ Hoffman, D.G. (1950) "Folk Tales of Paul Bunyan: Themes, Structure, Style, Sources," Western Folklore. 9(4) p. 316. ^ "The Salt and Pepper Shaker Museum Gatlinburg TN The most asked Question". Thesaltandpeppershakermuseum.com. 2014-02-25. Retrieved 2016-11-24. Would You Like Some Salt and Pepper? How About 80,000 Shakers Worth? This page was last edited on 21 January 2019, at 12:11 (UTC).